Practical life exercises the starting point of Montessori education. The child is introduced to very simple activities at first, such as how to carry a chair, how to roll a work mat, and how to wash his hands. Gradually the exercises become more complex. At each stage they must reflect the child’s interest and teach him new life skills. The Montessori material for teaching the child concepts of number is true to the principles underlying all the Montessori materials. The child builds his knowledge on what he already knows, and systematic progress is made from the concrete towards abstract reasoning. This is particularly important for the effective acquisition of an understanding of mathematical concepts and developing problem-solving capabilities. The Montessori environment is rich in oral language opportunities, allowing the child to experience conversations, stories and poetry. Reading is taught by the “phonetic” method. “Phonetic” means “by sound” and our whole system of teaching reading is based on teaching the child the sounds made by each letter of the alphabet. This is done first of all by the use of the sandpaper letters. 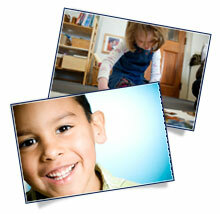 Montessori continually emphasized the importance of presenting to the child a whole view of the world. She repeatedly stressed the inter-relatedness of everything in the natural world, and saw man’s role as the protector of the natural world in which he lives, as well as an integral part of it. Cultural subjects, in Montessori terms, are the areas of knowledge which enrich the child’s understanding of all aspects of the world in which he lives. It is the responsibility of the Montessori teacher to facilitate the child’s absorption of knowledge in such a way that he acquires a truly global perspective. Biology, Botany and Zoology are presented as extensions of the sensorial and language activities. The comprehensive art and music programs give children every opportunity to enjoy a variety of creative activities, as well as gain knowledge of the great masters including: Henri Matisse, Georgia O’Keefe, Pablo Picasso, Jackson Pollock, Piet Mondrian, Vincent Van Gogh and others.